If you are considering selling your home or you are a buyer looking for your dream home. You need to contact a local REALTOR®. Clearfield County and Jefferson County PA. Can also help you in your relocation to and from almost anywhere. Go with a local realty office that knows the Clearfield and Jefferson counties market well. Your first choice should be Coldwell Banker Developac Realty with offices in Dubois and Treasure Lake, PA. Contact a local agent located in Clearfield. 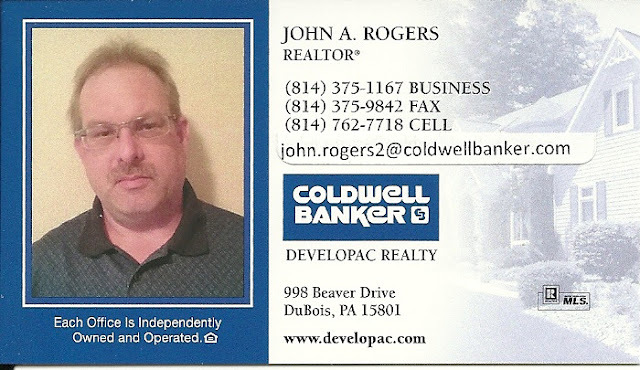 John A Rogers 814-762-7718 Dubois office 814-375-1167 Coldwell Banker Developac Realty.